On a BYU Study Abroad Program in London, Marianne Monson (BA ’98) of Hillsboro, Ore., visited a graveyard in Yorkshire where generations of her ancestors are buried. As she looked at the records of their baptisms into the Church of England and notations of their marriages and deaths in the spidery handwriting of another century, she thought about what could happen when someone changes religion—something her ancestors had done. Encouraged by professors to write what haunts her, author Marianne Monson uses historical fiction to bring the stories of her ancestors to life. Her new novel, The Water Is Wide, begins a trilogy that follows a young girl’s journey as an unbeliever living among Latter-day Saints in the early Church. She thought it might make a good story, and the idea, which percolated for several years, became the basis for The Water Is Wide, the first of a historical-fiction trilogy being published by Deseret Book. The novel is loosely based on the story of her great-great-great-great-grandmother, Jemima (Mima), who makes a critical decision when her mother joins the burgeoning Church of Jesus Christ of Latter-day Saints. In Monson’s tale, Mima does not share her mother’s belief and must choose between staying with her brother in London or climbing aboard a ship to accompany her mother to the United States. As early as age 6 Monson wrote in her journal that she wanted to become a writer. 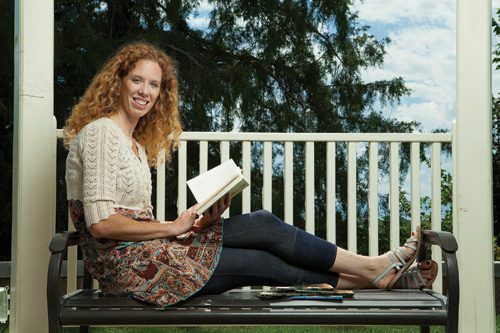 She held fast to that dream while earning a bachelor’s degree in English at BYU and when she became an editor of children’s books at a publishing company in Portland. However, she deferred her writing dream, in part, because she feared failure. Monson wrote the book to explore a girl’s journey toward spiritual peace regardless of religious background. At the same time, she wanted to examine what could happen when one member of a family joined the Church and another did not. Although in the book Mima joins her mother without becoming a member of the Church, in real life she converted with her mother. The second book in the series, Nearer to Thee, will be in bookstores this summer. Deseret Book has also published The Enchanted Tunnel, a series of chapter books Monson wrote for young readers.